Samuel Kaplan Milgram was an anarchist of Lithuanian Jewish origin. He appears to have spent some time in France as he spoke and wrote fluent French. He was imprisoned in the Soviet Union because of his anarchist ideas but managed to get to Germany. When the Nazis came to power he was imprisoned in the Dachau concentration camp but managed to escape from there. He then appears to have gone to live in Spain and according to his correspondence become a Spanish citizen a year later. However the circumstances of his life reveal that he was regarded as a stateless person. He had been active in the CNT for several years and volunteered for the Durrruti Column in July 1936. Seventeen months later the International Group of the Column was dissolved. Samuel Kaplan was desirous to continue in combat and he volunteered to join the International Brigade at Albacete. The recruiting officers refused to give him the post of truck driver that he had occupied in the International Group. Instead they proposed that he fight on the frontline as an infantryman. He immediately began to have doubts. He became aware that anarchists and other revolutionaries in units controlled by the Stalinists were often used as cannon fodder, put in vulnerable positions, or perhaps shot in the back (this appears to have been the fate of American Wobblies like Ivan Silverman and Harry F. Owens, among others). He refused the post and left the recruiting bureau with the intention of joining a CNT unit. However he was immediately arrested by the SIM (the secret police units controlled by the Stalinists). His arrest took place in February 1938. On 12th April he wrote a letter from a prison-wagon on the track at a Barcelona railway station. He and other CNT prisoners were mingled there with Francoist POWs in appalling conditions. On the 21st April he was able to send a letter from the prison at Castelldefells (the French Stalinist and International Brigade commander Andre Marty had set this prison up for Brigade dissidents and deserters and others in March 1938, with appalling conditions, many beating-us and tortures as well as summary executions). On the 29th April he was transferred to the prison-ship the Uruguay. He was able to get a note out on 21st June where he wrote : “ Here they have lost all human sense, and if in addition you protest they treat you so much worse. It is a thousand times worse than in Germany in the concentration camps. Since the 29th April I have not seen the sun and I lack food and soap to wash my clothes and face. We sleep on the ground in the greatest misery. I am despairing of being shut up with no news of the organisation or of my partner”. He enclosed this note in a bottle and threw it overboard, adding these lines to the note: “I beg the fishermen comrades who will find this letter of an anarchist imprisoned and treated in a fashion worse than at the time of the dictatorship to take it to the National Committee of the CNT, 30 Avenida Durruti, the French section of Barcelona. Salud Y Anarquia”. Amazingly enough this letter in a bottle was found by a sailor and taken to the CNT address. There the French anarchist Fernand Fortin read it. The note still exists in the files of the International Institute of Social History at Amsterdam.The National Committee of the CNT compiled a list of 70 detainees of the SIM who they regarded as genuine anti-fascists, and Kaplan featured on this, although incorrectly designated as Czech. In the following months Kaplan passed from prison to prison. In September 1938 he was at the camp of Pueblo Español on the Montjuich hill. On the 15th of that month he was shot in the back during an attempted escape. After a spell in hospital he was sent back to the Uruguay. On the 1st October he dispatched a letter from a SIM prison known as the Seminary on Rue Muntaner. “I am still ill, with my face and legs swollen because of lack of food”. On the 11th October he was transferred to the State prison in the Rua Deu I Mata. There finally he was able to receive aid, which included food parcels, tobacco and writing paper. We can read of two letters that he received from his partner Libertad, stuck in Valencia with no resources and pregnant. In October and November he complained in his letters of still not having seen a judge, and had not even been notified as to why he had been arrested and imprisoned. His expulsion posed a problem because he was classified oas stateless. In subsequent letters he complained about the lack of effectiveness of the CNT in having his case reviewed. He also complained about the cold. The SIM had confiscated his shoes so that during daily exercise, he suffered from cold feet. He began to recover his morale and said that if ever the CNT needed him he was ready to return secretly. As the weeks passed however the food rations were curtailed. He wrote to Fortin on the 20th December that he and other foreign volunteers were about to start a hunger strike. If they died of hunger they would convert this into one last political act. On 5th January 1939, Samuel Kaplan was transferred to the military prison at the castle of Montjuich. The director of the state prison decided to break the hunger strike, after four of those involved had died. Samuel continued his hunger strike, and was put in a death row cell. On January 21st, Franco's troops entered Barcelona. The prisoners who were unable to escape were shot. Samuel Kaplan was not among their number. Had he already died? Was he killed later? Or had he somehow escaped? As there appears to be no further trace of him, we must suspect the worst. What an absolutely awful story. Thanks so much for writing and posting. TLC Nate, thanks so much for your comment, I have sent you an email and look forward to finding out more. My father escaped to Africa soon after Franco took over Spain. He was interned in a prison camp in Tangiers from which he escaped, I believe helped by either another inmate or a guard. He went to Morocco and then sailed to Mexico. His passage was paid for by a cousin who by this time lived in the U.S. Up until the time he sailed he was in touch with Libertad. He sent her a post card telling her he would send for her as soon as he was able. To my knowledge that was the last time he heard of her. After he arrived in Mexico his letters to her were all returned undelivered. I believe Libertad kept the post card but I do not know what happened to it. In Mexico he worked as a travelling businessman. I believe he may have been involved in international trade as he travelled to the US on occasions. During this time he tried to find out what happened to Libertad through the Red Cross and similar organizations. He eventually gave her up for dead. He was briefly married to a woman from Chicago but divorced within a year. Sometime around 1947-1948 he met my mother a Mexican woman born in Veracruz. They had one son, Samuel Caplan Jr. (the spelling of our surname had been changed at some point) who was born in 1949 in Veracruz. He subsequently moved the family to Tijuana, where I was born in December 1952. About two or three years later my parents split up as a result of a new relationship of my father’s. He built a house for my mother and my brothers (my mom had a son from a previous relationship). This house was in Rosarito, Baja California, Mexico. He moved with his new mate to another house in the same town where he lived until he passed away in August 1998. He was almost 89 years old. He found out he had a son, Mario who by now lived in France with his wife Eva and his daughter Eva and son, Gaspar. Gaspar is the one that found your article while researching on the web and passed the information on to me. My father had several close calls with death in his lifetime not the least of which were during his time in Europe. He worked at various jobs but mostly in electricity and commercial refrigeration. He once climbed a light pole to work and electrocuted himself spending several days in the hospital after miraculously surviving a 20,000 volt discharge. Another time he was driving a large truck and rolled it over. He spent about six hours trapped in the wreckage while they cut the cabin away to extricate him. That one required a few weeks in the hospital and a long recuperation that was most exasperating to him because he was ever active and the limitations of a full torso cast made him desperate to be active. He was a self-educated man reading voraciously and enjoyed good conversation with anyone who could put forth a well-reasoned argument. His preferred topics were philosophy, politics, and religion. My brother Samuel and him did not get on well and always had difficulties. My father and I had a great and friendly relationship although we were at opposite sides of the political spectrum. I am a conservative and he remained always a rebellious anarchist type. We had some great conversations and disagreed heartily about most topics but we respected each other. I met my half-brother, Mario and his mom Libertad in 1981 on a subsequent trip with my father. We have a great friendship, we stay in touch and I have visited him and his family and he has been to visit us here in California. As you can see, the story is incredible and inspirational and I am only summarizing it here without a lot of details. I can tell you that although he spoke frequently about his life in Europe he never mentioned his internment in Dachau. I am in contact with professor Godicheau and he is going to search his files for some of the letters he has of my father. It has been almost twenty years since my father died and he continues to surprise us. That is an amazing story! Thanks to Nathalio for the contribution. Unfortunately that isn't the case. 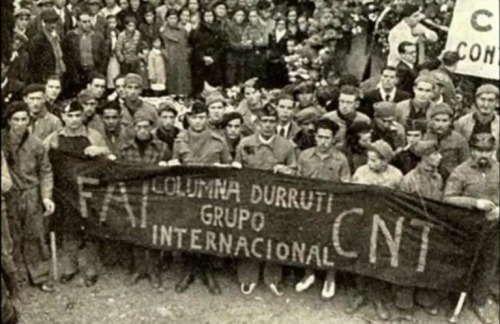 The CNT as an organisation could have done far more for its prisoners, the fact that it didn't was a major source of radical opposition to the organisation's leadership and of alternative organisational endeavours from even before May '37. Ultimately the CNT had become a part of the state apparatus, so from an anarchist point of view the fact that the organisation chose disciplining its members over solidarity with them should not be surprising - but even so the callous attitude of its leadership is shocking when you see it in black and white in the sources. Steven I'll dm you my email, I've not got loads of time but I'd be happy to help out with some transcribing and translating if the poster is interested. Cheers. If you can read French or Spanish, Godicheau (especially), Guillamón and Amoros all refer to it. There's some relevant info in Ealham's bio of Peirats and Stuart Christie's stuff. Other than that you can check out my phd if you like. thanks. What was your Ph.D.? Why don't you post it up to our library/history section? It's about anarchist opposition to state collaboration in 1937. I want to make it open access but I'm getting it published and I'm waiting to check what the score is. In the meantime if you want to read it send me a message. I wanted to write a brief follow-up to my earlier comments posted above and in reply to several comments and inquiries on this topic. First off, everyone should know that some of the details in the OP were completely new information and I am still trying to grasp the significance of them and the effect they had in my father's life and subsequently that of our families. For example, I never knew he was interned in Dachau. I can well imagine my father did not want to add that to his anecdotes and then have to relive a lot of painful experiences in telling about that particularly ghastly place. Second, the OP caused me and my nephew (Samuel's grandson) to do some more digging around. We are working on a joint project to organize the information we have with the goal of sharing some and using the bulk of it for a book long in the making. On this part I want to tell you all how touched I am and to express my thanks for the many offers to help with this project. I am transferring the tapes he left (magnetic audio cassette- you know, the stuff we used to use for recording before MP3 and such!) and once I get that done I will reach out for help with transcribing from sound to written word. Finally, an anecdote. My father was fond of saying he had been kicked out of every decent country worth getting kicked out of. When he passed in 1998 Mario (the son Libertad was pregnant with when Samuel left Europe) suggested we repatriate his ashes and bury him in Petrel, Alicante, Spain. I went to a friend of mine who owned a funeral parlor and he told me I could send his ashes by commercial carrier as that is what he would do and charge me several hundred dollars. I packaged the ashes and included some photographs and notes from his grandkids and shipped to him to Spain via UPS. Three or four days later I arrived home and found the package with my father's ashes on my doorstep. Apparently he had been rejected for travel back to Spain. Kicked out of a country yet another time. I then sent him via US Postal Service and on the customs declaration I wrote the package contained "Personal Items," After all, what can be more personal than one's own ashes? Three months later he had not made the "two week delivery time" to Spain. After a number of calls and conversations with Mario we figured he was as yet again rolling around who knows where in the world and I decided I had to "bite the bullet" go to the post office and hope they could locate his ashes somewhere in transit. The day I was to go Mario called and told me my father had finally arrived. He is buried in Petrel alongside Libertad's second husband and where she subsequently joined them quite a few years later. I'm very glad that Libcom as a website could be of help in tying your family history together! The internet is really quite amazing. And huge thanks for wanting to help us fill in yet another one of the thousands of the missing spots of our movement, another one of the quite amazing destinies of another one of the larger-than-life characters who dedicated their life to resistance against right-wing tyranny. agree heartily. my reaction to this thread is "this is amazing!" What a great story. Glad to hear that he made it out! I have finished digitizing all the audiocassette tapes my father recorded. As with many things, this project has encountered a number of obstacles all of which pale in contrast to my father's life. I will be uploading the digitized versions to my nephew's server. I will look into some methodology for interested parties to enable them to listen to them. 1-I did not digitize them in the order that he recorded them so at some point I will have to listen to them one by one and make some semblance of chronological order. Now that they are in digital form I will be going on to the next step of transcribing them so I can put the narrative in chronological order. Unfortunately, tis process will have to wait a couple of months as I am now in the middle of selling my house and moving out of state. In fact, the move is what prompted me to finish the digitalization process as I did not want to go carting about dozes of audiotapes that only work on what is now considered obsolete equipment.